In addition to our cabin style buildings, Better Built also offers garden sheds, cottage sheds, garages, playhouses, and tea houses that offer additional functionality. These buildings make great storage units while providing additional features allowing increased usability. Be sure to check out the new Loafing Sheds and Chicken Coop models as well. hold up under heavy use and provide a lifetime of service. Pricing on all buidlings includes FREE DELIVERY*. The Lofted Porch makes a great getaway space. Overhead lofts and a covered porch offer a unique combination of storage shed and cabin or utility space. The Portable Casita is a great storage building with overhead lofts. It also makes a great lakeside retreat, or cabin getaway. Add log siding for the old time look! The Office provides on site convenience. The benefits of a portable shed plus an on-site office. 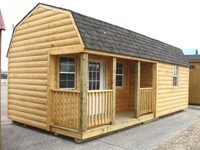 Makes a great cabin with a conventional gable style roof and design. The Mini Cottage offers "country charm" with unique roof lines and styling. This building has a lot of character and still provides plenty of storage space.